A rare, slow-growing, hypervascular, benign but locally invasive tumor. Seen at Cp angle near jugular foramen of the temporal bone. Represent small collections of paraganglionic tissue, derived from embryonic neuroepithelium admixed with autonomic nervous system, found in the region of the jugular bulb. Globus jugulare is a part of group Paraganglioma, also referred to as chemodectomas or nonchromaffin paragangliomas. Paragangliomas are found at other sites also, including the middle ear (glomus tympanicum), the carotid body (carotid body tumor), and the vagus nerve in proximity to the inferior (nodosum) vagal ganglion (glomus vagale tumor, glomus intravagale tumor). Association of glomus jugulare is reported with Pheochromocytoma, parathyroid adenoma, and thyroid carcinoma. Histologically Glomus jugulare described as dense matrix of connective tissue among nerve fascicles. Expand within the temporal bone via the pathways of least resistance such as air cells, vascular lumens, skull base foramina and the eustachian tube. Spares the ossicular chain. Often noted as an incidental finding. May go unnoticed due to non specific and insidious onset symptoms, diagnostic delay is common. Predominantly occur in female, common during their fifth and sixth decades of life, more common on the left side. 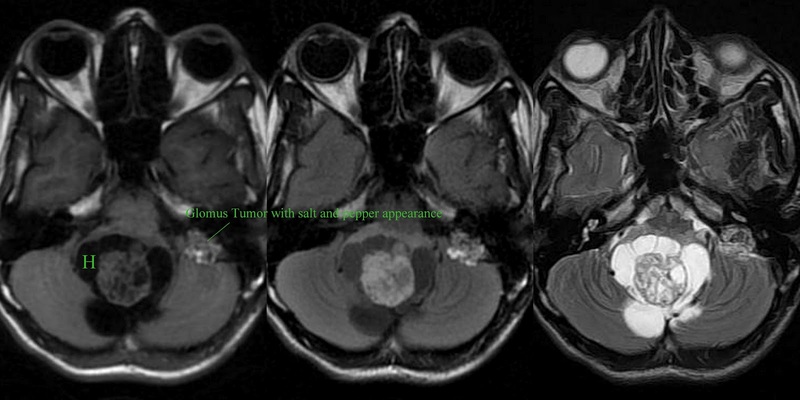 Multicentric tumors are known in ~ 3-10% of sporadic cases and in 25-50% of familial cases. Metastases from glomus tumors occur in approximately 4% of cases, includes lung, lymph nodes, liver, vertebrae, ribs, and spleen. 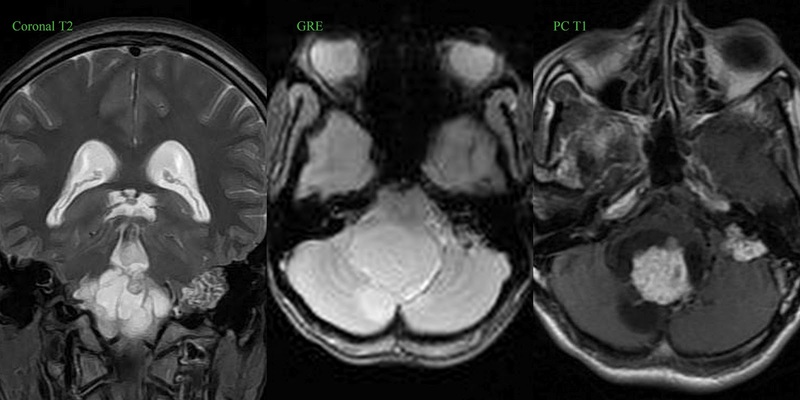 CE MRI is investigation of choice, characteristic salt and pepper appearance on T1 and T2-weighted images. A case: A 40 y o female presented with hydrocephalus due to a significant mass effect from a typical operated and histopathologically proven Hemangioblastoma at the floor of posterior cranial fossa with a cyst and an intensely and homogeneously enhancing mural nodule. 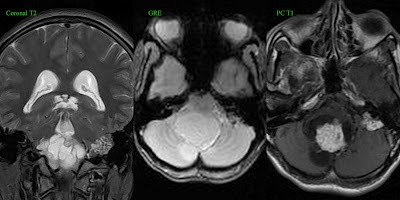 Here are her pre operative MRI Brain T1, FLAIR and T2w images. A Glomus Jugulare tumor noted as an incidental finding at left Cp angle with typical imaging findings of salt and pepper appearance, intense and homogeneous enhancement on below post contrast T1w images. Might be an endolymphatic sac tumour in VHL.